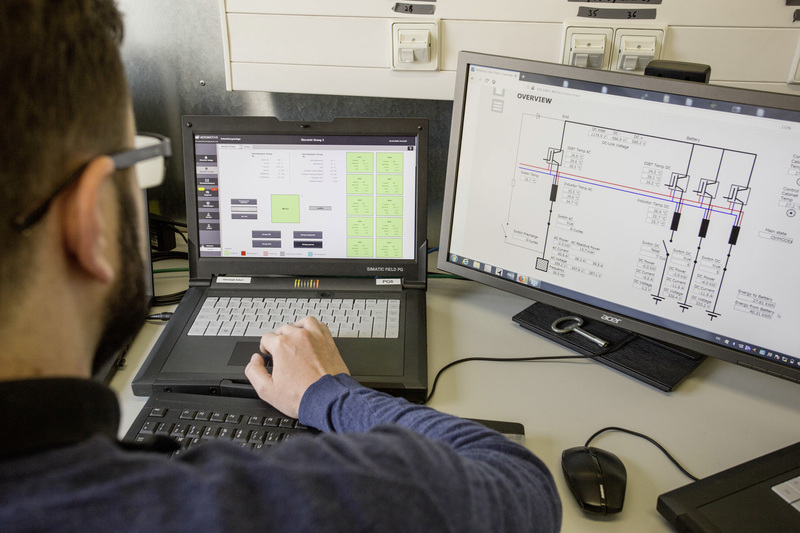 Transmission system operator TenneT and Daimler AG through its wholly owned subsidiary Mercedes-Benz Energy GmbH have researched and tested the feasibility of innovative system services in the transmission grid as part of a joint development partnership. The results are groundbraking: Automobile battery storage systems can take over tasks from large-scale power plants and make a significant contribution towards power grid stabilisation and system recovery. The joint study was carried out within the framework of the Enera project as part of the “Smart Energy Showcases – Digital Agenda for the Energy Transition” (SINTEG) funding programme by the German Federal Ministry for Economic Affairs and Energy. 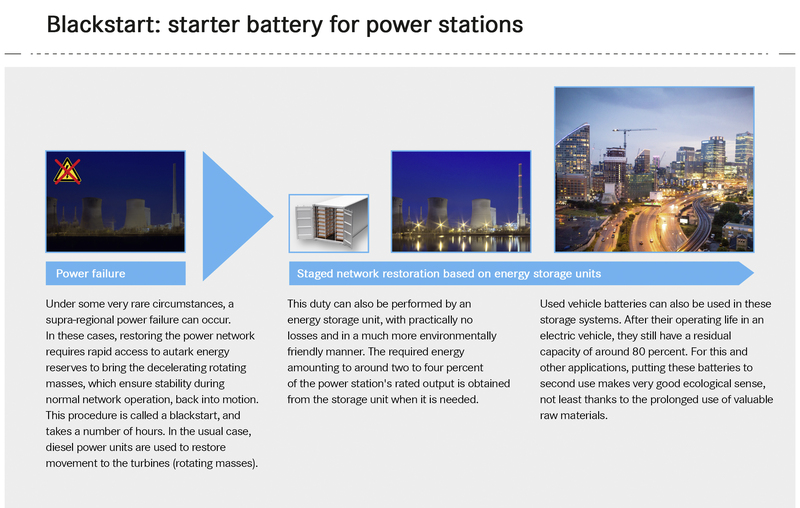 The project partners have shown that automobile battery storage systems that use a lithium-ion basis can be used for highly dynamic system support and system recovery – specifically for a black start in power plants and to support mass inertia. Ultimately, this can help to compensate for the loss of conventional energy generation. For the development partnership, the prototype of a battery storage system made up of automotive batteries with a total connected load of approx. 1 megawatt (MW) and a storage capacity of 750 kilowatt hours (kWh) was installed at the test centre in Kamenz. These are second-life and replacement batteries. Electricity production is becoming considerably more volatile due to the increasing in-feed of weather-dependent forms of renewable energy. In the power grid, generation and consumption need to be balanced in order to maintain a frequency of 50 Hertz. If this is not the case, frequency deviations can occur. The masses of large-scale power plants, which rotate in synchronisation with the grid frequency of 50 Hertz, ensure that these fluctuations are dampened so that the system responds to these deviations in a more inert way. This is important, as frequency deviations can only be compensated with a delay through primary balancing power. Without the inert masses in the grid, the frequency would change so quickly that no compensation through balancing power would be possible. This would lead to ever-greater frequency deviations, which in the worst-case scenario could cause power failures. At the Mercedes-Benz Energy test lab in Kamenz, the project partners have now shown that automobile battery storage systems can respond to a changing frequency in less than 100 milliseconds. This means they can replace the inert masses in large-scale power plants. The project partners have also shown that battery storage systems can be used to start up energy generating assets and even entire power stations, for example after a large-scale power failure. Today, diesel power units are used to restart turbines in power stations (rotating masses) and supply power to auxiliary units. The development study shows that this can also be done with battery storage systems – with virtually no losses and in a process that is much better for the environment. The energy storage system acts as a kind of “starter battery for the energy supply” and restarts the inert rotating masses of a power station. The necessary energy, around two to four percent of the rated capacity of a power station, is retrieved from the energy storage system if needed. To prove this, the project partners constructed a test grid in Kamenz and restored it after a simulated power failure using the automobile battery storage system. In the next phase of the development partnership, the project partners will work together to define the requirements that will enable a tender process for the future system service by TenneT. Daimler AG is one of the world's most successful automotive companies. With its Mercedes-Benz Cars, Daimler Trucks, Mercedes-Benz Vans, Daimler Buses and Daimler Financial Services divisions, the Group is one of the leading global suppliers of premium cars and is the world's largest manufacturer of commercial vehicles. Daimler Financial Services offers financing, leasing, fleet management, insurance, investments and credit cards as well as innovative mobility services. The company founders, Gottlieb Daimler and Carl Benz, made history by inventing the automobile in 1886. As a pioneer of automotive engineering, Daimler sees shaping the future of mobility in a safe and sustainable way as both a motivation and obligation. The company's focus therefore remains on innovative and green technologies as well as on safe and superior vehicles that both captivate and inspire. Daimler continues to invest systematically in the development of efficient powertrains – from high-tech combustion engines and hybrid vehicles to all-electric powertrains with battery or fuel cell – with the goal of making locally emission-free driving possible in the long term. The company's efforts are also focused on the intelligent connectivity of its vehicles, autonomous driving and new mobility concepts. This is just one example of how Daimler willingly accepts the challenge of meeting its responsibility towards society and the environment. Daimler sells its vehicles and services in nearly every country of the world and has production facilities in Europe, North and South America, Asia and Africa. In addition to Mercedes-Benz, the world's most valuable premium automotive brand (source: Interbrand study, 4.10.2018), as well as Mercedes-AMG, Mercedes-Maybach and Mercedes me, the brands smart, EQ, Freightliner, Western Star, BharatBenz, FUSO, Setra and Thomas Built Buses and the Daimler Financial Services brands: Mercedes-Benz Bank, Mercedes-Benz Financial Services, Daimler Truck Financial, moovel, car2go and mytaxi. The company is listed on the Frankfurt and Stuttgart stock exchanges (ticker symbol DAI). In 2017, the Group had a workforce of more than 289,300 and sold around 3.3 million vehicles. The application of IFRS 15 and IFRS 9 in the 2017 financial year would have produced corporate sales of €164.2 billion and a corporate EBIT of €14.3 billion. Before the change to IFRS 15 and 9, corporate sales for the 2017 financial year as reported were €164.3 billion with a corporate EBIT for the 2017 financial year of €14.7 billion. CASE – these letters are shaping the future of mobility. They stand for: connectivity (Connected), autonomous driving (Autonomous), flexible use (Shared & Services) and electric drives (Electric). The four pillars of CASE are an integral part of the corporate strategy of Daimler AG. The goal is, through intelligent combination of the CASE pillars, to shape intuitive mobility for our customers. Mercedes-Benz Cars already plays a leading role in all four areas. For example, all activities in the area of connectivity are focused on the digital brand Mercedes me, which gives customers access to an extensive and personalised range of services by app, website or straight from their car. On the way to autonomous driving, Mercedes-Benz has for years been a key driver of development and has repeatedly set the benchmark. To this end, the Mercedes engineers use what is known as sensor fusion. The data from different sensors, such as cameras, ultrasound and radar, are intelligently combined and analysed. With the smart vision EQ fortwo the smart brand also shows what form driving without a steering wheel could take in the future of car sharing. The inventor of the automobile already plays a leading role in sharing & services. The mobility services used by more than 18 million people range from free-floating car sharing (car2go) to ride hailing (mytaxi) and the mobility platform (moovel). Mercedes-Benz is pursuing a holistic approach regarding the electrification of the drivetrain and is developing the EQ brand with a family of vehicles and a holistic ecosystem, and a holistic ecosystem, which, alongside the vehicle itself, also comprises a comprehensive range of electric mobility-related offerings. This extends from intelligent services to energy storage units, charging technologies and sustainable recycling. On the road to zero-emission driving Daimler is pursuing a three-track drive strategy to realise maximum environmental compatibility across all vehicle classes (incl. commercial vehicles and vans) – with an intelligent mix of state-of-the-art combustion engines and partial electrification with 48 volt technology, made-to-measure EQ power plug in hybrids and electric vehicles with battery or fuel cell drive. By focussing on CASE Daimler is preparing for the intuitive mobility of the future. With the funding programme "Schaufenster intelligente Energie - Digitale Agenda für die Energiewende" (SINTEG), the Federal Ministry of Economics and Energy wants to show what the future of energy supply could look like. The idea of SINTEG is to develop and demonstrate transferable model solutions for a safe, economical and environmentally compatible energy supply with variable power generation from renewable energies. Suitable solutions from the model regions should serve as a model for a broad implementation in the whole of Germany and European countries. In the five showcase regions, partners from the energy industry and the information and communications sector will cooperate. Since 2017, more than 300 companies, research institutions, municipalities, counties and federal states have been working together to implement the vision for the future of energy system transformation.